After Nokia's Q2 Results announcement, Nokia's stock price jumped nearly 7% because of the market's low expectations. Many observers are of the opinion that, despite the losses, there were positive surprises, such as the sequential rise in Lumia shipment figures, smartphone average selling price (ASP) and feature phone shipments. Let's take a look at the veracity of these claims. 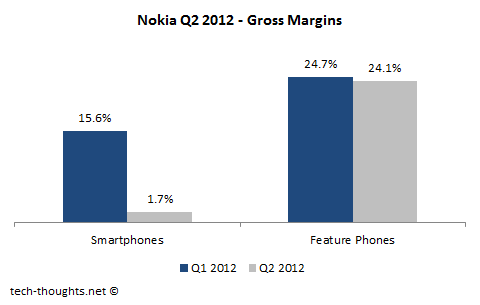 Nokia declared that they shipped 4 million smartphones in Q2, doubling the 2 million shipments from Q1. While, on the face of it, this looks like a tremendous success, but the truth is a little more complex than that. Since, Nokia has staggered the release of Lumia models across different regions, the rise in shipments could be attributed to additional shipments to newer markets, as opposed to rising shipments to existing markets. For example, the Nokia Lumia 710 was released in the US, on T-Mobile, at the beginning of Q1 and it was the only Lumia model available in the US in that quarter. Meanwhile, the Lumia 900 was only released in Q2 in the US, on AT&T. 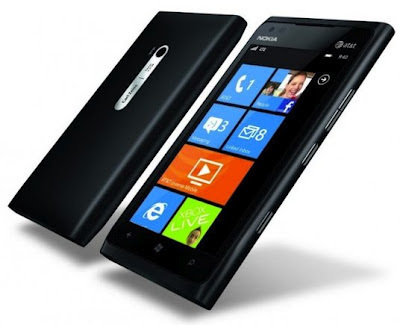 Therefore, as of now, rising Lumia shipments are not indicative of market demand, but rather of OEM focus. Shipments have doubled because Nokia is focusing on pushing Lumia models to various markets. This is really interesting. 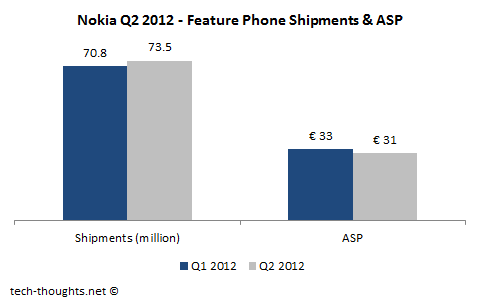 The ASP for Nokia smartphones has risen to €151, from last quarter's €143. 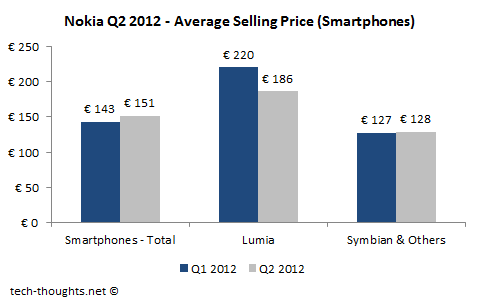 But the ASP for Lumia smartphones fell by about 15% and the ASP for Symbian smartphones remained flat. So how did the ASP for smartphones increase? Nokia says it's because of the increasing share of Lumia in the product mix. But from the chart in the Lumia shipments section, we can see that the primary reason is that the shipments of Symbian based smartphones, which have been under considerable pricing pressure, have been crashing. 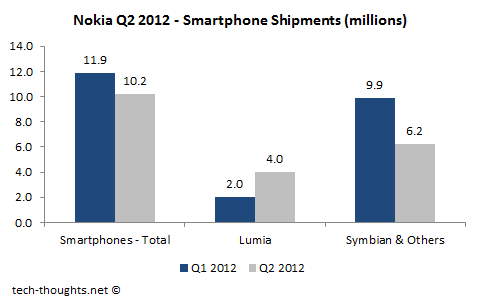 In fact, the drop in Symbian shipments is still outpacing the gain in Lumia shipments, despite the staggered release. Another reported positive surprise was the rise in Nokia's feature phone shipments. Nokia's feature phone segment has seen increasing competition from low cost Android-based vendors, especially in emerging markets. Based on the figures above, the rise in feature phone shipments seems to have been driven by price cuts, leading to revenue from this segment reducing by 2.5%. But I suppose, this is still relatively good news compared to the situation in the smartphone segment. Nokia took a huge hit to its smartphone gross margin in Q2, primarily due to excess component inventory, future purchase commitments and inventory revaluation of "Lumia, Symbian and MeeGo devices". My first guess about the excess component inventory & future purchase commitments is that Nokia deliberately moved these costs to Q2 to try and prop up the smartphone performance in Q3, which is expected to be much worse after Microsoft's Windows 8 decision. The revaluation of smartphone inventory is also a major concern as it indicates lower sale value and hence lower demand. The key here is that Nokia hasn't just revalued inventory of Symbian & MeeGo devices, but Lumia devices as well. This means that market demand for Lumia devices has been considerable damp as well. Conclusion - As we can see, most of the positive surprises in Nokia's Q2 results seem to be dressed up facts, as opposed to genuine cause for optimism. Based on Microsoft's Windows Phone 8 announcement and global smartphone market share trends, I expect Nokia's Q3 results to be considerably worse.